They can also perform some missions now done by tiltrotors. Apparently from IMDS 2013 but an interesting concept. I'm waiting for its prototype pictures! Alexei Leonkov, military expert of the magazine "Arsenal of the Fatherland"
To be honest I always thought that Bartini design was brilliant... 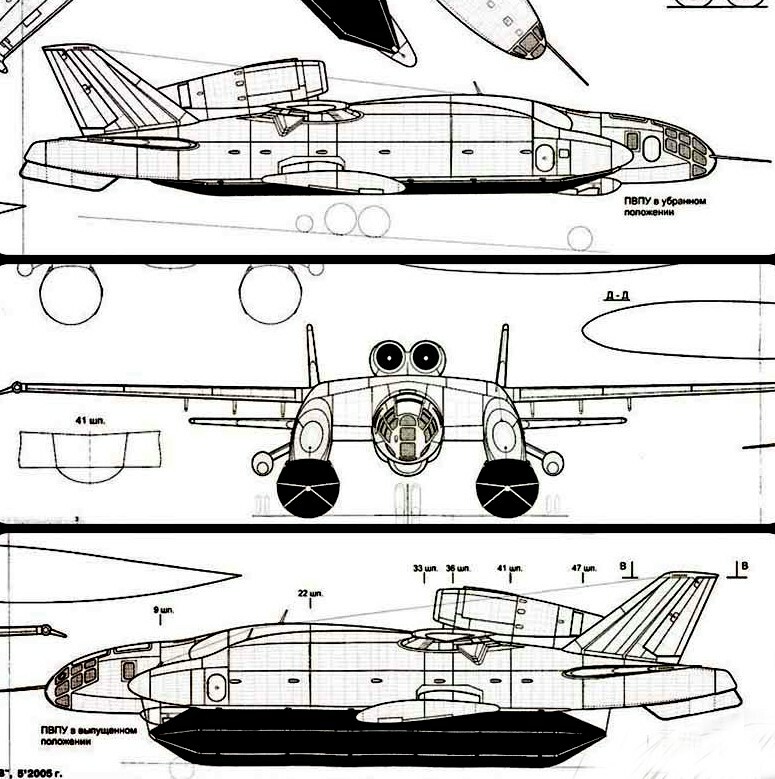 I mean just the aircushion undercarriage so it can land on snow or ice or water or land and anything in between... though lack of wheels and brakes would make the landing and takeoff runs quite long but who cares? Big high bypass cold air turbofans blowing high volumes of air under its wings should have made it rather better too. GarryB wrote: To be honest I always thought that Bartini design was brilliant... I mean just the aircushion undercarriage so it can land on snow or ice or water or land and anything in between... though lack of wheels and brakes would make the landing and takeoff runs quite long but who cares? And this was another prototype sitting on the water with lifting cushion not inflated. 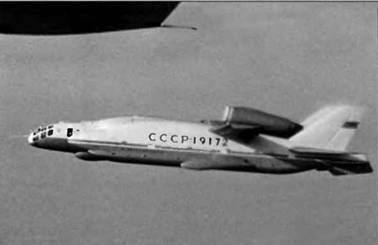 In 1976 14М1П transferred to testing showing after output on dynamic pillow camera much lifted nose, maintaining movement. Trouble started when for the first time dramatically reduced the engine speed boost. Machine with this far down in the water, and it happened the water was poured DWI motors. Revealed low reliability system control. However, test confirmed the opportunity use dynamic air pillows for take-off and landing aircraft with excited water surface. 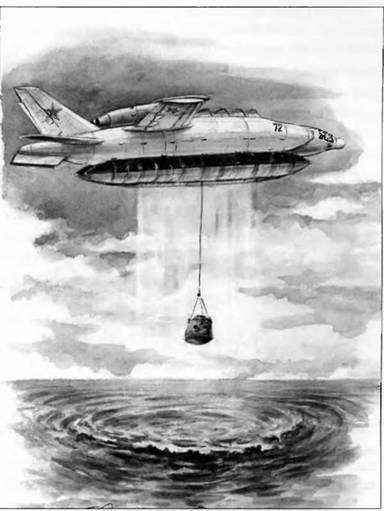 When tests 14М1П was installed what effect dynamic air podesk manifested at altitudes of 10-12 meters at medium]i aerodynamic the wing chord of 10.75 meter, and the spacecraft altitude alignment 8 meters air the pillow was already GAK dense and sustainable, the pilot Yu Kupriyanov repeatedly asked guide allow throw the handle management the machine of the village itself. 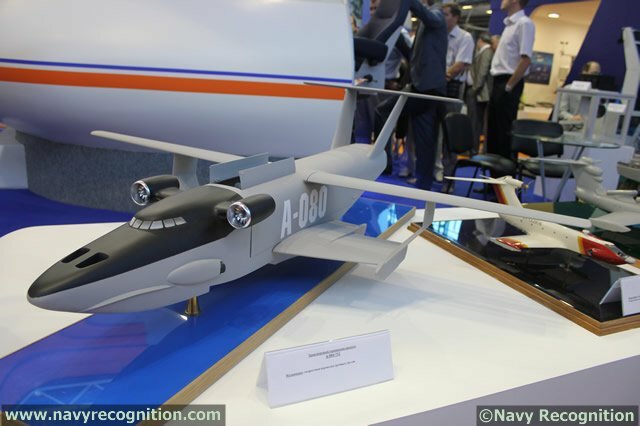 This feature aerodynamic scheme 14М1П would the wig VTOL-2500, medium aerodynamic wing chord which reached 250 meters fly using effect location the land on altitudes of 150-200 meters. On such heights you safe to fly over storm sea and easily to get around occurred on the way obstacles including ships. Aerodynamic testing of the model of a promising intercontinental heavy ground-effect vehicle began in Zhukovsky near Moscow . 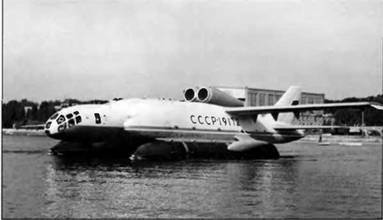 They are conducted by the Zhukovsky Central Aero-Hydrodynamic Institute. The tests of the model are carried out in the framework of the project of creating a heavy intercontinental WIG. 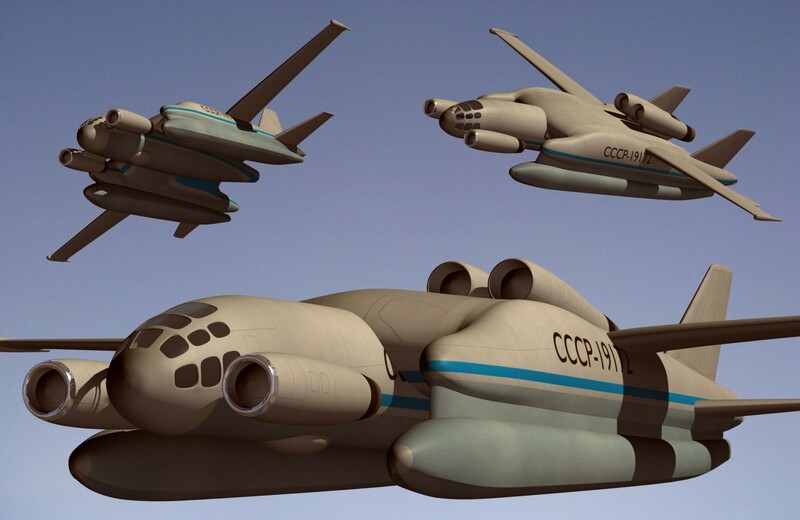 According to the characteristics laid down in the project, the aircraft must be able to transport cargo weighing up to 500 tons to a distance of up to 6,000 kilometers at a speed of at least 400 kilometers per hour. The purpose of these tests is to improve the aerodynamic layout of the prototype WIG. 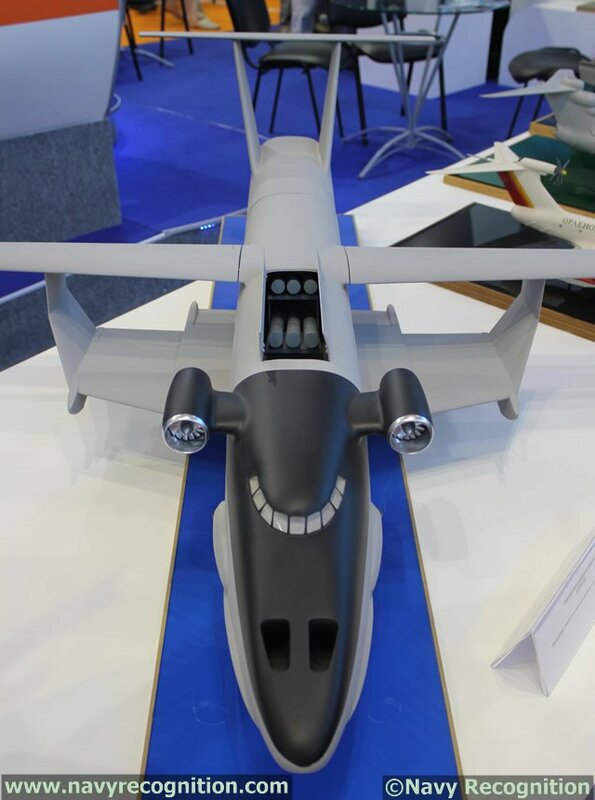 It is planned to create a prototype model of an Orlan airplanes armed with rockets in Russia as part of the state armament program for the period up to 2027. This was announced to journalists by Deputy Prime Minister Yuri Borisov. "There is an Orlan research and development project in the State Weapons Program of 2018–2027, which provides for the construction of a WIG. A prototype will be created as part of this weapons program, it will carry rocket weapons," said Borisov. According to him, the ground effect vehicle will be used to protect the Northern Sea Route, where the infrastructure is poorly developed. "It can patrol, close these areas. The inland seas too: the Caspian Sea, the Black Sea," said the Deputy Prime Minister. 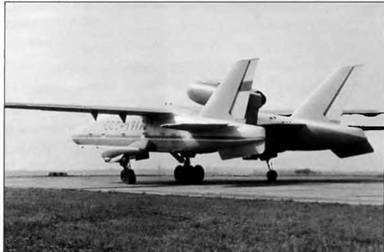 Tsavo Lion wrote: [i]Aerodynamic testing of the model of a promising intercontinental heavy ground-effect vehicle began in Zhukovsky near Moscow . They are conducted by the Zhukovsky Central Aero-Hydrodynamic Institute. He wouldn´t do it. Then he would have to rebuild the whole mess. China could buy dozens, if not 100s of them & invade Taiwan, Philippines & Vietnam to make the S. China Sea a Chinese lake & start colonizing SE Asia, alleviating fears of Chinese expansion into Siberia. Then Russia will have extra $ to build up her navy. Why should the chinese attack their trading partners? Just while Amiland does invade countries all the time it doesn´t mean that civilized countries would do the same. Hole wrote: Why should the chinese attack their trading partners? Civilization & organized warfare r 2 sides of the same coin. The USSR & Nazi Germany were also trading partners, but planned war on each other resulting in the Great Patriotic War. The Mongols, Chinese, Apaches, Comanches & Mexicans traded & raided each other too. The kingdom of Hawaii also traded with the USA. Trade between states doesn't prevent disputes from escalating to wars & the smaller 1s being swallowed as a result. The reality of trade doesn't impose any constraints on geopolitical ambition however, and the likelihood of conflict usually boils down to a cost vs risk calculation, governmental forms of governance (demo-crazy or not) notwithstanding. I don't see any real risk of China turning belligerent like the US has become because they simply have more to gain by engaging in mercantilism than by resorting to aggression. I cannot imagine a single scenario where the CCP politburo would sign-off on aggressive military adventurism against a trading partner. They simply have so much to lose and comparatively little to gain. If anyone disputes this, a little thought experiment would be in order. Put yourself in shoes of Xi Jinping and come up with a scenario that would make you order your military to launch aggression against a neighbor. The necessary caveat is that this must be a unprovoked aggression, not a response to anothers action. I would defend my interests, incl. going to war to create & maintain the new reality. Recall how & why China took Tibet in 1954, S. Vietnamese held islands in 1974 & invaded her recent protege SRV in 1979. They taught Hanoi, the USSR, & themselves good lessons! Tsavo Lion wrote: I would defend my interests, incl. going to war to create & maintain the new reality. Recall how & why China took Tibet in 1954, S. Vietnamese held islands in 1974 & invaded her recent protege SRV in 1979. They taught Hanoi, the USSR, & themselves good lessons! S the o last intervention was in 1979 on their border right? Sinc ethen they started to trade. US is still at war in all continents. How many millions people was killed in Chinese interventions last 25 years? BTW NG is pro US libreast media no wonder that they always write form"estern values" perspective. . Even though for west Russians are second class people to be either slaves or exterminated. I think you need a little history lesson... Tibet has been recognised as Chinese territory since at least the 1700s, and this is enshrined in all current treaties between the Great Powers. Even when China collapsed in 1912 with the end of the Qing dynasty, and Tibet went its own way by virtue of distance and lack of a central power, not a single Western nation recognised an independent Tibet. When China recovered in post-colonial period (ie Europeans left, the Japs defeated in WWII, and the Nationalists defeated by Mao) the return of central unified rule made it inevitable that the Communists would restore authority. The "long suffering Tibetan people" is a myth spread by Tibetan exiles and promulgated by Western propagandists. The reforms intended to transform Tibet from a backwards medieval feudal society were not always easy, and the Chinese admit many mistakes were made. But there were no mass killings or "genocide", and actions that be called "repression" only started after the Dalai's sect revolted in 1959 with CIA assistance. Did the exiles really think that they could call on the Capitalists for help in overthrowing Chinese authority and then not expect a backlash when the revolt fails? What would the US have done if Californians had instigated a communist revolt during the McCarthy years? The only people who have issue with Tibet being part of a unified China are western propagandists and the lunatic fringe of Tibetan militant nationalists (who are stooges of the Dalai lama and his octogenarian cliche). Economic development, fuelled by Han Chinese investment, will cement Chinas' claim once and for all, and win the hearts and minds of the Tibetan people. Nay-sayers can simply stew in their own juices for all I (or the Chinese) care. The same western "freedom loving" liberals who thought Myanmar just needed a woman in charge like Aung San Suu Kyi and everything would be good there... except that it isn't... they might even take back her peace prize... but then they didn't take back Obamas when he didn't end up doing anything of note either. Oh, Obama did plenty of note: he started 7 wars. hoom wrote: Oh, Obama did plenty of note: he started 7 wars. This is minimum to get a noble piss prize. BTW 7 stands in cabalic umorology for infinity right?